We went looking for the best fishing backpack and we found the perfect one. It’s the Wild River Nomad by CLC Tackle Tek. This backpack will go anywhere, carry all of your gear, organize everything perfectly, and stay comfortable if you have to wear it all day. It’s truly a “single solution” pack. 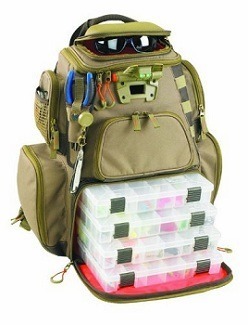 Although it’s more expensive than a simple $30.00 Bass Pro Shops tackle backpack, it is more durable and more versatile. Buy it now and you’ll never need another backpack. Tray Storage: The Wild River Nomad has space in the bottom of the pack for 4 medium-sized #3600 tackle trays. That’s more room than most tackle boxes have! External Equipment Holders: On the outside of the pack, the Wild River Nomad has attachment locations for a variety of tools. There is a sunglasses holder mounted to the pack that’s cushioned to keep your sunglasses safe. A removable pliers holder can come off the outside of the pack so you can attach your pliers to a belt if you need them closer. A self-retracting lanyard on the outside is a great place to keep small tools or keys. They are attached to a solid surface that is safe from the water yet still functional. Padded Straps: Unlike most fishing backpacks, this one uses padded shoulder straps with a sternum strap designed to distribute heavy loads. Therefore you can do more than just carry this bag from your car to the boat. It will handle a days worth of hiking if you need it to. Fold-Down Work Surface: The front pocket opens and folds down to create a useable work surface. Base Pads: On the bottom there are base pads and a strong durable bottom that help keep internals dry. Rain Cover: The pack includes a rain cover that can be deployed fast to keep everything dry. LED Light: An integrated LED light system is built right in the pack to illuminate the attached fold-down work surface at night. If you couldn’t tell already, this is one of the best fishing backpacks for a good reason, it does everything. The LED light puts out 13 lumens and has 3 levels of brightness. It’s certainly bright enough to light up a small boat at night. The fold-down work surface is unique and unlike anything else on the market. Additionally, there’s enough total space that you’ll be more tempted to keep adding gear before you’ll ever have to worry about fitting everything in the bag. It all stays organized too. There are plenty of compartments that keep your gear in easy to access places. It’s easy to find packs to hold your gear that are less expensive. But those packs will prove useless, run out of room, or fall apart long before this backpack ever stops working. This is definitely the top fishing backpack for sale. You will have to pay a little more upfront, but you will never have to purchase another backpack again.